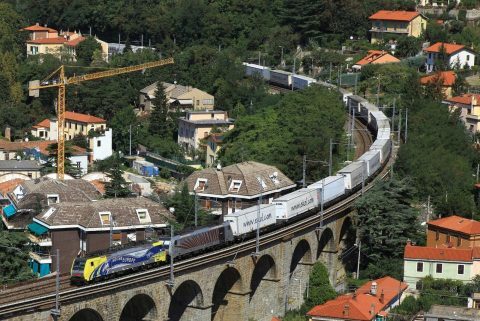 A co-ordinated European solution to tackle rail freight noise is the only way to prevent unilateral policies threatening the internal railways and interoperability, the EU’s Transport Commissioner Violeta Bulc has warned. She told the Symposium on Competition & Regulation in Rail that by failing to work together, member states would force a situation that nobody wanted. Hosted by German national rail carrier Deutsche Bahn in Berlin, the 10th annual Symposium brought together stakeholders from science, politics and economics to debate the regulatory framework in the rail sector and other network industries. It is designed to focus on issues which perhaps do not get the attention they deserve in the wider field, and Ms Bulc was one of a series of high profile speakers who also included Michael Odenwald, from the German Federal Ministry of Transport and Digital Infrastructure, and Dr Rüdiger Grube, (now formerly) of Deutsche Bahn, who also represented the Community of European Railway and Infrastructure Companies. Work had already begun – specifically the revision of the TSI rolling stock noise reduction policy – to address it, she said, and the European Commission aimed to finalise the revision process in the first half of 2018. Ms Bulc urged delegates to work constructively on an EU-wide solution which had to be efficient, cost effective, fair and one with which all member states could align their national plans. “And if we don’t? Then we run the risk that member states will introduce national, unilateral measures. Such types of measures would put the internal railway market and rail interoperability at risk. They would force the Commission to take action – let us not go there,” she added. She also referred to the recent Rail Freight Day event in Vienna, which showed how much ‘we can and do’ to make rail freight corridors deliver. This would be done by solving problems whether they are operational, legal or political; by consulting the sector, including end-customers like shippers and forwarders, to see what works and what doesn’t; and by bringing forward tough options for investments. The Düsseldorf Institute for Competition Economics and the ESMT European School of Management and Technology were co-organisers of the Symposium.